Brittany is a large peninsula located in northwestern France. Known for its tranquil sea breezes and an amenable climate, this region is home to a number of holiday campsites. Please contact Lux-Camp to learn more about this camping in Brittany. The history of Brittany goes as far back as prehistoric times. It has been occupied by cultures such as the Romans, as well as the Britons and other Celtic tribes. Brittany is now an important luxury camping destination. This is due to its wide range of beaches as well as several pristine nature preserves found within close proximity. 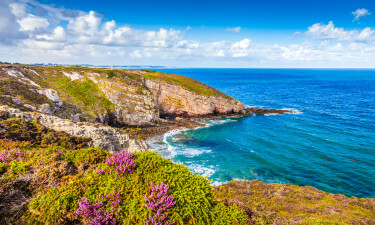 Brittany's northern coastline is rugged with a maze of rocky coves, while to the south, the shore is flatter with long stunning sandy beaches. 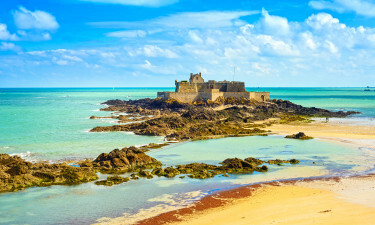 Brittany's close proximity to the channel ports makes it the perfect camping holiday region. the longest of coastlines and you’ll reach Brittany. 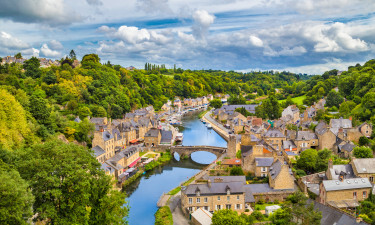 Brittany resembles Britain in many ways, but with a particularly mild climate, stunning sunsets, beautiful beaches, historic cities and picture-postcard villages, it’s an ideal destination for a camping holiday. LUX Camp offers a wide range of all the best campsites in Brittany. Book your next luxury family camping holiday online or contact one of our highly experinced sales agents to learn more about camping and campsites in Brittany. Le Domaine Des Ormes is a large holiday camping resort. It offers 45 hectares of land. One can stay in a luxury tent, a mobile home or a bungalow tent. 700 pitches are provided and some of these are designated for younger crowds. Modern conveniences such as Internet access, on-site power and food provision facilities are present at this luxury campsite in Brittany. Chateau de Gallinee is another holiday camping site in Brittany. This 35-hectare estate is quite amenably priced while still offering many modern conveniences. Nearby beaches are wonderful examples of the famous Emerald Coast and it is possible to enjoy a day of sailing or surfing. 273 pitches and entertainment for children ensure a great stay for the entire family. Le Grande Metairie is a seaside resort that offers camping luxury under the sun. Besides being situated along the beach, a large outdoor water park as well as on-site nature excursions allow Le Grande Metairie to be an ideal choice for those who enjoy fun in the sun. Wireless Internet and numerous pitches round out this resort. A handful of popular beaches in Brittany include Dinard, Ile de Batz and a 30-kilometre stretch known as the Pink Granite Coast. Many endangered species can be found in preserves such as the Crozon Peninsula and the Parc d’Armorique. A selection of holiday camping sites is found close to such wonders. Some of the top attractions are the Quimper Cathedral, the Georges Delaselle Garden and the Brest Natural Botanical Preserve. Likewise, cities such as Nantes, Redonne and Rennes offer spectacular views of the architecture of Brittany. Brittany is known as a producer of some of the best wines in France. Moreover, many of the foods are organic in nature; fresh Atlantic fish and farm-raised cattle allow for a wonderful meal. The locals are quite cordial, albeit slightly reserved. Their level of English is impressive and they are happy to accommodate most needs.